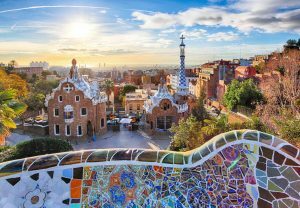 Take a tour, and discover Gaudi in Barcelona! Exploring the streets of Barcelona is an experience unlike any other. Rather than navigating through gleaming glass skyscrapers, you’ll find yourself ducking under serpentine shaped halls and sauntering through an immense, dripping, Gothic sand castle. These striking and unusual buildings are the work of the visionary architect, Antoni Gaudi. Take a tour, and discover four fascinating pieces of Gaudi architecture in Barcelona! The construction of La Sagrada Familia began in 1892 and isn’t expected to be complete until 2030. The architect’s sudden death halted construction of his most famous work, and several years of politics and indecision has left Gaudi’s magnum opus incomplete. Although undone, the church represents the relationship between man, nature, and God. If you’re traveling to Barcelona, it’s recommended to book your tour of La Sagrada Familia well in advance. While Gaudi’s work typically reflects his adoration of nature, the Casa Calvet is a prime example of the architect’s dynamic abilities. Built between 1898 and 1900 for the Calvet family, Casa Calvet is known as Gaudi’s most conventional work. The artist gathered inspiration from the Baroque period to complete the stone facade, as well as the distinct sculptural decoration. This entry was posted on Wednesday, September 13th, 2017	at 9:10 am	. You can follow any responses to this entry through the RSS 2.0	feed. Both comments and pings are currently closed.